We are delighted to announce Ralph’s return to the Royal Albert Hall on the 12th of May 2016. With a body of work represented by well over 300 songs, Ralph varies his stage performances on each tour to include some of this vast repertoire among his new compositions, and each night a carefully conceived program is tailored to accommodate requests from his audience. It was the sheer number of requests sent in each night that gave Ralph the idea for this very special show. 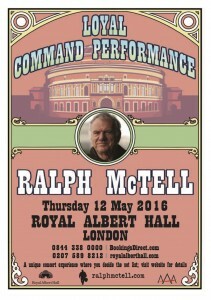 Ralph McTell’s LOYAL COMMAND PERFORMANCE. For this Royal Albert Hall concert we decided to let Ralph’s audience, past, present and future, to nominate ALL the songs to be performed. You can nominate choices of songs by clicking here.